Breathtaking views in this cozy cabin. Perfect for you and a friend or two, WiFi, hot tub and ready for you! The breath-taking mountain views at Two Willow Cabin are waiting for you! Sit out on the large front porch and relax. Enjoy listening to the babbling brook nearby. Dogs are welcome too! This secluded two bedroom and one bath hand crafted cabin offers a hot tub for you to gaze at the stars on a clear night, gas grill to cook up your favorites, gas fireplace for a warm comfy evening and a full kitchen for the chef. There is a loft for any extras! You will also find direct TV, DVD, stackable washer and dryer plus many games and more! Everything was done through emails, very efficient and quick responses. Great location, clean through out, well stocked from kitchen to bedrooms. Quiet, great views, private and being able to bring our dogs huge plus. We could not have asked for a better place to stay. Mountain view, perfect cabin. It has been my dream since I was a little girl. My husband and I will be back! We enjoyed another PERFECT stay in the Two Willow Cabin. We had everything we needed in the well-stocked cabin. This was our second stay and we'll definitely be back. Thank you again for everything! The staff consistently offers exceptional service as we plan our stays in red lodge. The stay at Two-Willows was a slice of heaven! I cant say enough about how beautiful and cozy our stay was. Great for a weekend getaway and rejuvenation! The view of the mountains from the front windows and hot tub was breathtaking. We cant wait to come visit again! This was my daughter and my 3rd visit to Two Willow cabin. Everything is perfect. We thank Skip and Deb from the bottom of our hearts for allowing us to come enjoy ourselves in their beautiful cabin. The hot tub is absoulutely the best. I have rented 3 times and each time has been a great experience. Second cabin I have stayed in, in the area. Cant wait to go back! Absolutely perfect cabin! we were greeted by owner ,very nice people!Management team was great with us as I requested late check out!Peaceful area ,if you are interested in quiet place,this is it! 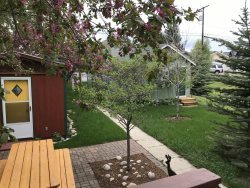 "Great stay Location is ideal for treks into Yellowstone over the Beartoothpass and Teton National parks. Beautiful views on the front porch in or out off the hot tub. Service was great, ran low on propane to fire the grill and it was replaced pronto. Red Lodge is a great town only a few miles away. Would highly recommend to anyone who wants a Vacation in the West. " "Wonderful!!!!! Beautiful view of the mountains and cozy cabin perfect for our visit! The visit from the Golden Retrievers was a treat because we left ours at home :-) AAA Red Lodge Rentals were Super! Thank you!! " Cute little cabin. Great views! Only con is that it is a "guest house" and is no more than 100 feet from the main house; not very secluded. However they have two great dogs that come and visit!